Every so often I glance at my UFO pile and think about finishing some of those projects languishing in it. Well finally I have finished one after several attempts and it is such a relief to get it done to a wearable stage! 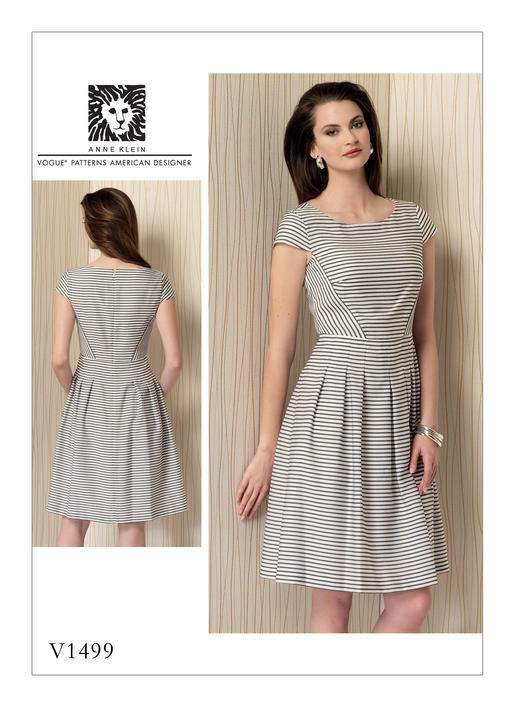 This is Vogue 8667, a princess seamed dress with a rolled collar and a skirt options. Looks pretty simple right? 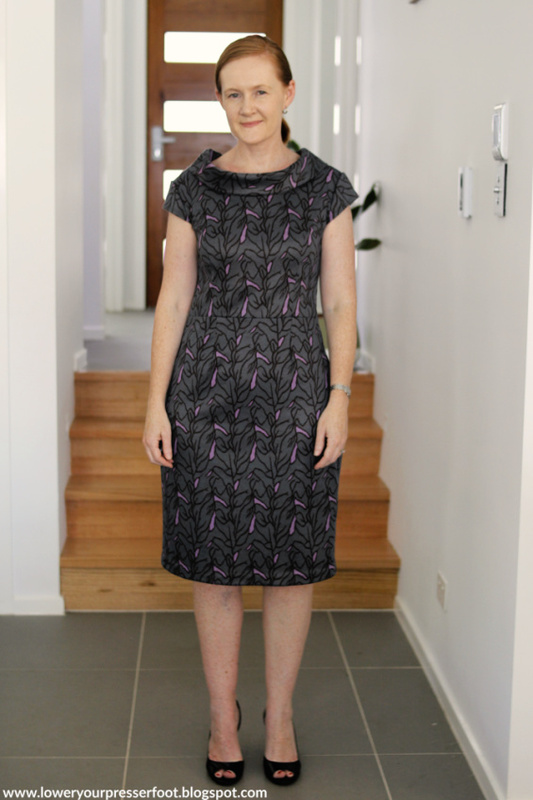 I had originally set out to make view E - the straight skirt and short sleeved version. I don't know why it took me so long to finish this - I just kept losing steam at every hurdle. Firstly I should have measured the flat pattern pieces more carefully to make sure I sewed the right size, because it turned out way too big. So I set it aside for a while to think about it. A few months later I picked it up again and pin fitted it while wearing it - I had to take the dress in quite substantially at the sides to make it fit across the bust. I also flattened the bust curve to make a faux small bust adjustment. 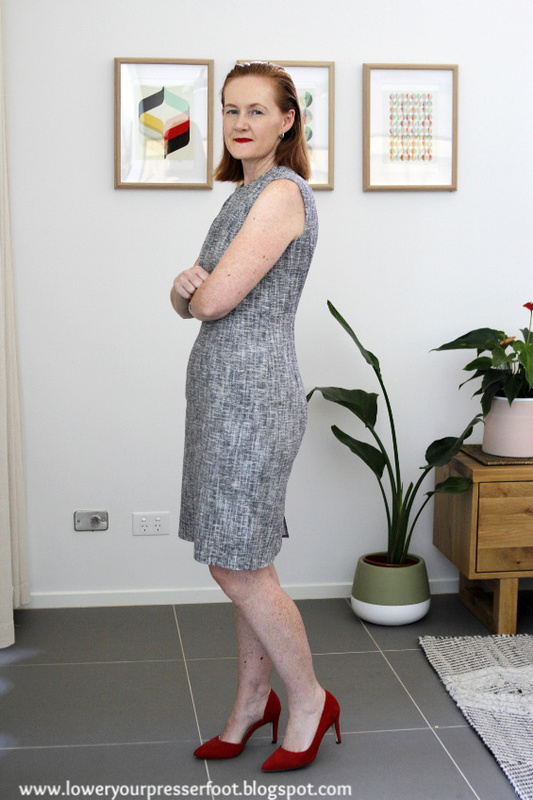 But once I had made that change the sleeve would no longer work - it was too big to fit into the now much smaller armhole opening, but making the sleeve narrower made it too tight to fit my arms! So away it went again for a few more months. Finally in January this year I decided to either finish it or scrap it, but thankfully it worked out. I changed the sleeve to a cap sleeve so I could get the shoulder coverage but not the tight feeling around my bicep - it all worked out in the end phew! But the real star of this dress is the rolled neckline. 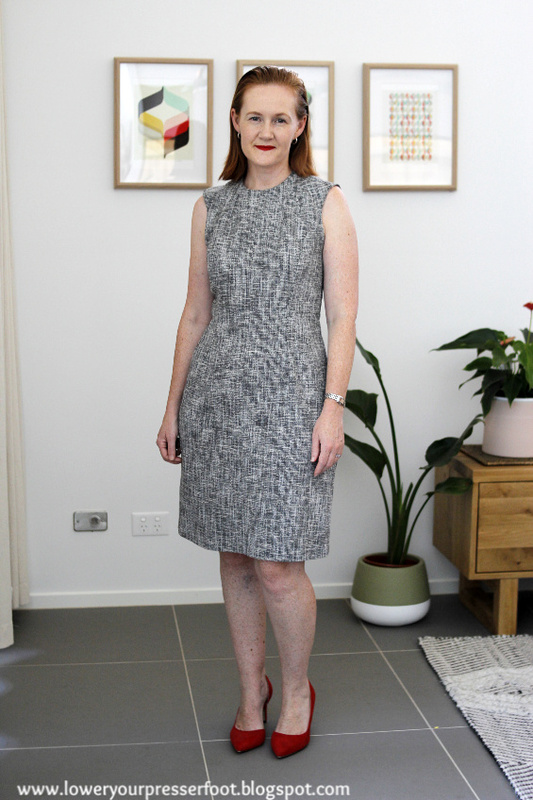 I love the wide neckline and stand up collar - I feel very ladylike when wearing this, but it does make it hard to wear a jacket or cardigan over it. I've left the collar at the back to splay open above the top of the zip. It is meant to have a hook and eye at the collar roll line (ie at the halfway point of collar) to make it stand up slightly, but I knew from past experiences with this type of collar that the hook and eye never stay closed and my hair tends to get caught in it instead. The other design aspect I like about this pattern is the waist seam - it helps get a neater fit for my swayback. It causes pattern disruption at the waist line of course, but in a busy print like this it's barely noticeable but you can see from the side view that the fit is quite tailored. So even though it took me a very long time to finish this dress, I'm glad I didn't give up on it and preserved until the end. I really can't explain why I had no enthusiasm for this particular project - the fabric is a lovely double knit from the Remnant Warehouse in a great teal and lilac coloured print and I do love the design lines of the pattern. I guess that sometimes you just need to be in the right frame of mind. 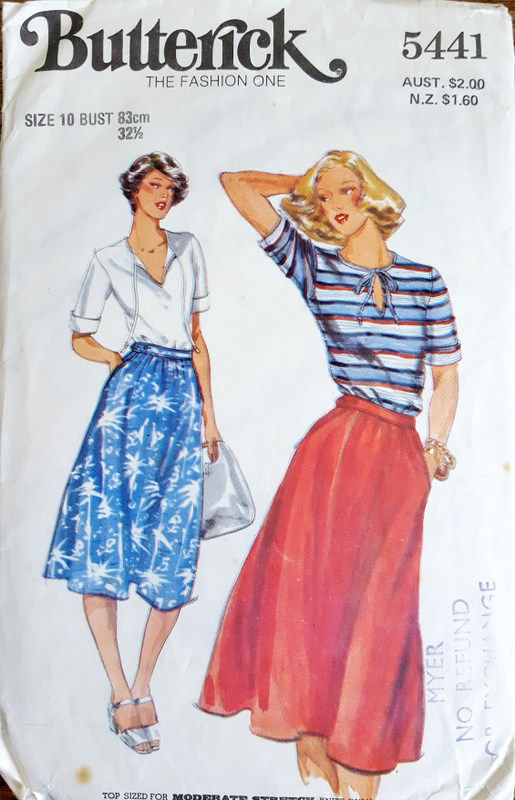 I never would have thought that a simple 1980s pattern with a rather dowdy cover illustration has become a favourite skirt pattern of mine! 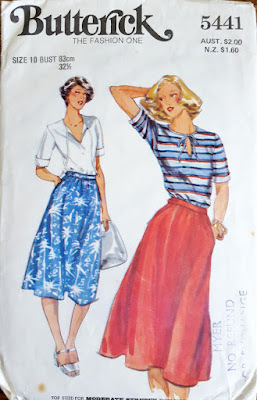 But I've now made four versions of Butterick 5441, with no plans for stopping yet. 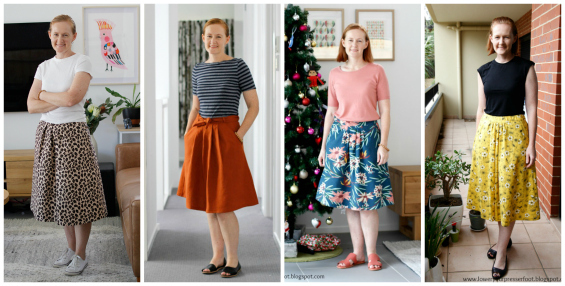 It's a fairly simple mid length skirt pattern which until last year was definitely not a length I'd usually wear since I'm not particularly blessed in the height department. However I have discovered that this length can look flattering, and has the added bonus of covering up my legs on those lazy days when I haven't shaved my legs. After four versions I've now made a few modifications to perfect the fit - instead of gathers at the front I pleat the fabric so it sits flatter across my stomach, I've shifted the zip from the side to the centre back and instead of gathers at the back I put in darts instead. The latest version I made is from a leopard print cotton, jumping on the animal print trend that seems to be everywhere right now. 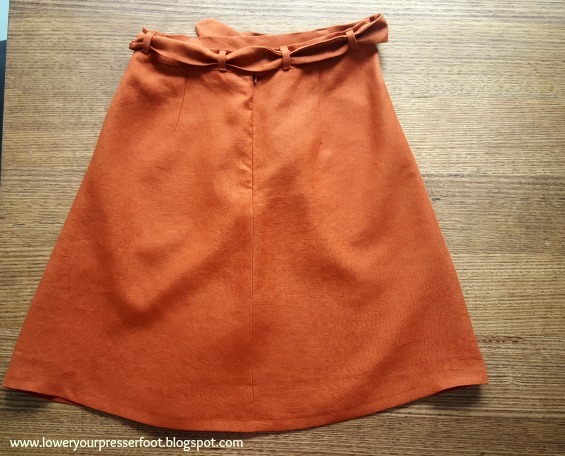 It's a fairly thick cotton with little drape, so it makes the skirt flare out quite a bit which I like. It has pockets which is always useful! A change in top and shoes makes it look quite different I think. 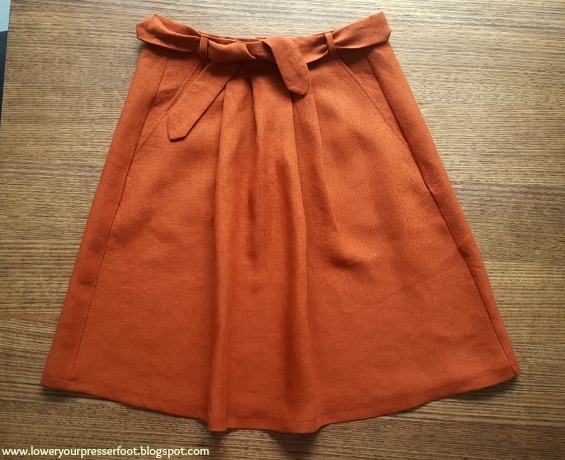 Back in January I made a version from a mid weight linen in paprika from The Fabric Store which was left over from some wide leg pants I made last year. This one drapes nicely because the linen has softened up a lot after many washes. For this version I shortened it to knee length so that I could squeeze it out of the leftover fabric and added belt loops for a self fabric tie belt. The second version I made last year in December (that's why there's a Christmas tree in my photo I swear!). This is a gorgeous cotton print in a deep teal colour I bought from Nerida Hansen during one of their irresistible sales. I also shortened this to knee length as I only bought a remnant piece. 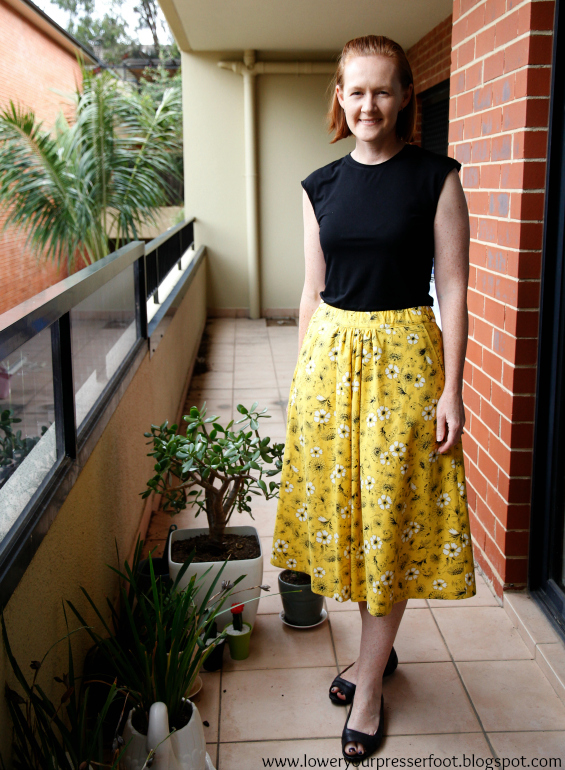 Finally, here is the original version I made back in 2017 (blogged here) made in a lovely yellow Japanese cotton I picked up from a Sydney Spoolettes fabric swap that was kindly donated by Stef. 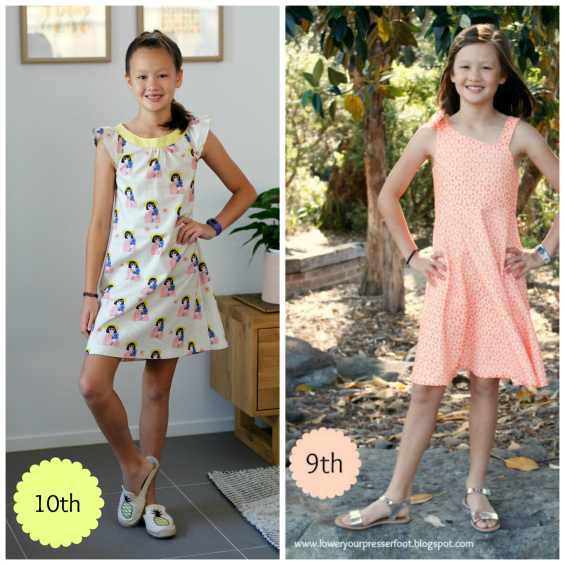 This one is still in high rotation in my wardrobe, so clearly it's a winner! I've recently changed roles at my work and it has meant coming back to work full time after working part time very happily for the last ten years. It's a promotion and now as the responsible adult in the room I figure I need to look the part, so I'm really trying to step up my corporate wear this year. 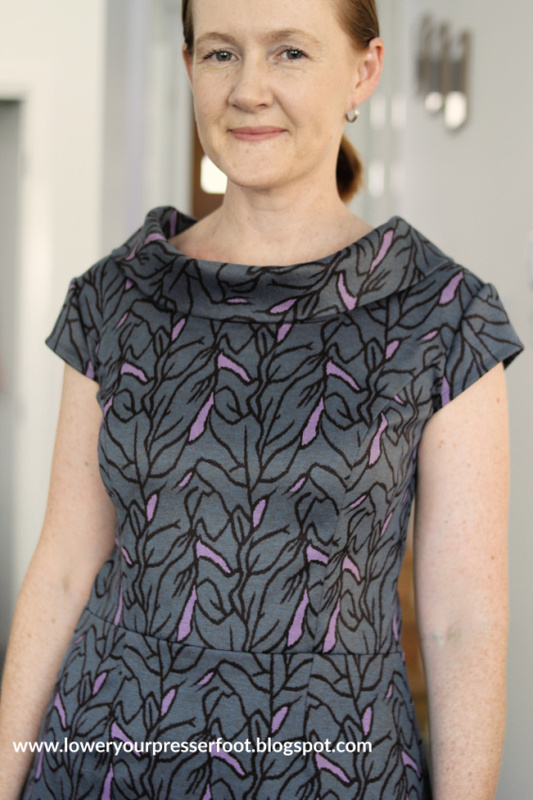 This is Vogue 1156, an OOP print Anne Klein pattern that has been in my stash for a few years just waiting for the right fabric to come along. And actually I don't think this fabric is the right fabric - all those darts and seam lines are barely visible which is annoying because it was quite tedious doing all the ones in both the fabric and the lining! Not being very blessed in the bust department those darts do create a bit of puffiness at the front of the dress that my bony chest can't fill out, but apart from that it's a well fitting dress. I made a minor sway back adjustment to the centre back, and graded out from a size 8 at the bust to a size 14 at the hip to fit my pear shape and it all turned out pretty well. The only thing I have a minor problem with is the neckline - it is so high that I feel like I'm being choked, especially when I'm sitting down at my computer or driving. I interfaced the neckline because this fabric was a loose weave, and I under-stitched the seam allowance to the lining so I think that creates quite a hard edge to the neckline which makes it worse. I just need to find the energy to unpick the neckline and re-sew it because it really is annoying. This fabric is a lovely soft poly-cotton tweed like fabric from The Remnant Warehouse. I bought two metres initially planning to make some trousers, but since I'm so terrible at making trousers and the fabric was quite wide I realised that making a dress and a matching jacket (which is underway) is a far better use of the fabric. 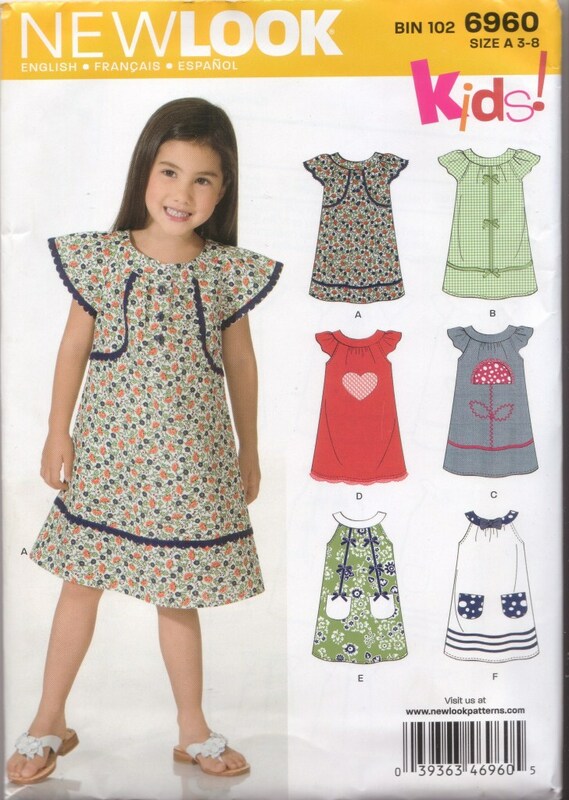 I think this is a great pattern, but it seems it wasn't so popular with all the sewists out there on the internetz. 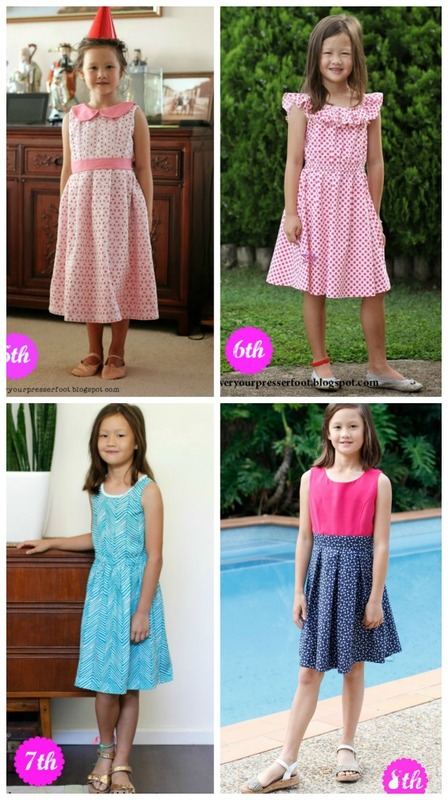 There are only 4 reviews on Pattern Review and no others that I can find. 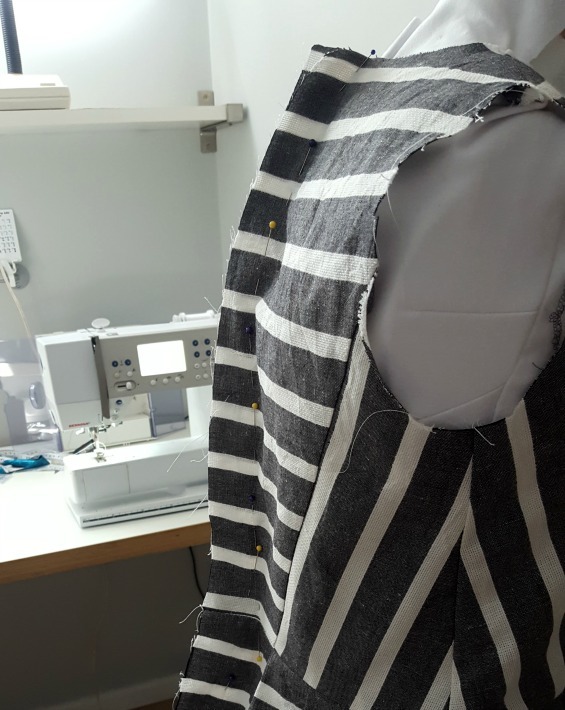 The pattern is a bit involved with all those separate pieces and darts but isn't too difficult and all those seam lines offer a lot of opportunity for fitting. 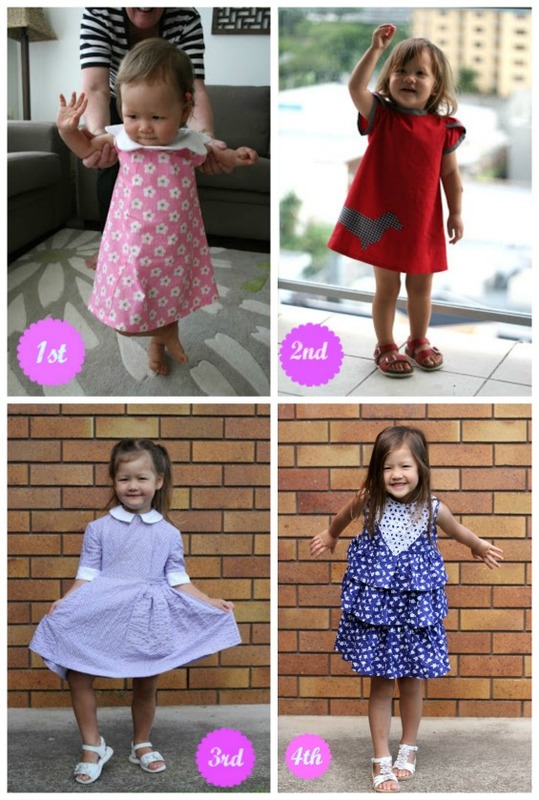 I would like to remake this dress in a plainer fabric - I'll add that to my never ending to do list! Fitting wise I just ignored the pattern sizes on the envelope and went by the finished measurements on the pattern because this pattern has a lot of ease. I ended up cutting two sizes smaller than the pattern indicated, using a size 8 at the bust, a size 10 at the waist and a size 14 at the hips. I also did a basic small bust adjustment by flattening out the bust curve on the princess seam. I still had problems easing in the fabric and ended up with a few ripples there which is annoying. 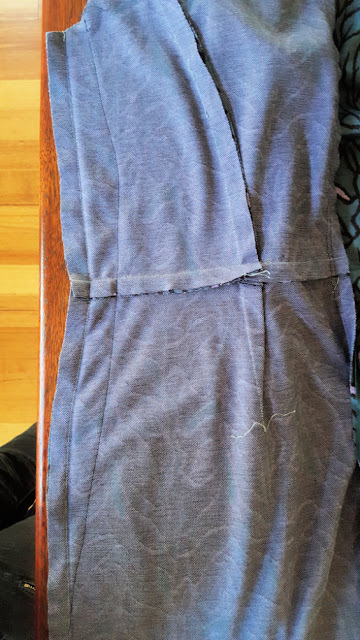 The back and side views are fairly unexciting - just a plain scooped neckline at the back and the irregular print meant I didn't have to exactly pattern match at the seams for a nice change. It's a bit on the casual side for my work wardrobe, but on a day when the city hit 40degC I figured it was fine. I put on a jacket to combat the air conditioner in my office which is always set to freezing and called it good! 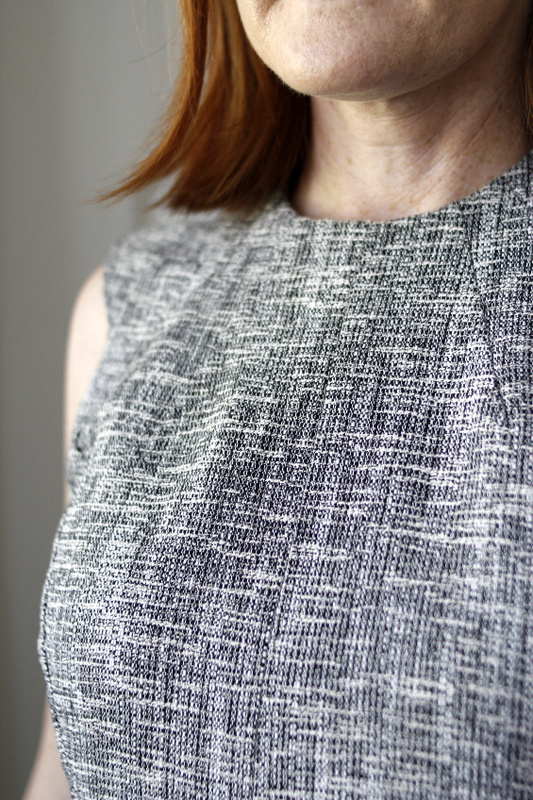 A linen sundress is the perfect thing to wear in these conditions, and I just happened to pick up some stripe linen from Pitt Trading only a few weeks ago - a new dress and using fabric before it hit the stash is a double win. This is Vogue 1499 which has been around for a few years but is still available because it seems to be a very popular dress judging by how many photos come up in a simple google search. The only other change I need to make for future versions is to lower the bust darts by about 2cm - obviously as time has gone on things are in the same place as they used to be! Either that or I need to buy a super push up bra...... I might also make those cap sleeves a little wider because while they feel fine when standing with my arms down they felt a little tight while driving. But overall I really recommend this pattern - it's quite simple despite looking complicated and was really quick to sew up. Perfect for hot summer days. Although ironically I wore this to work yesterday when it was a bit cooler but my office had the air conditioner set to arctic so I had to pop out at lunchtime and track down a cardigan to buy so that I didn't freeze all afternoon! This is New Look 6960, which is OOP and may be the last time I use this pattern. It only goes up to size 8 which still fits Anna because she is a bit of a bean pole, but it's not overly large on her. I guess I could grade it up, but with so many other patterns in my stash I probably won't. 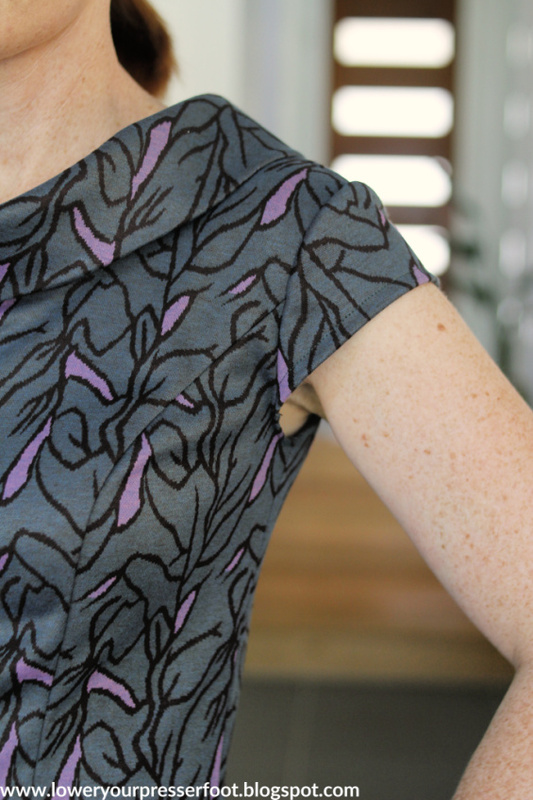 For this dress I've used a Jennifer Bouron print on cotton bought from Nerida Hansen specially for this project - no stashing this fabric! 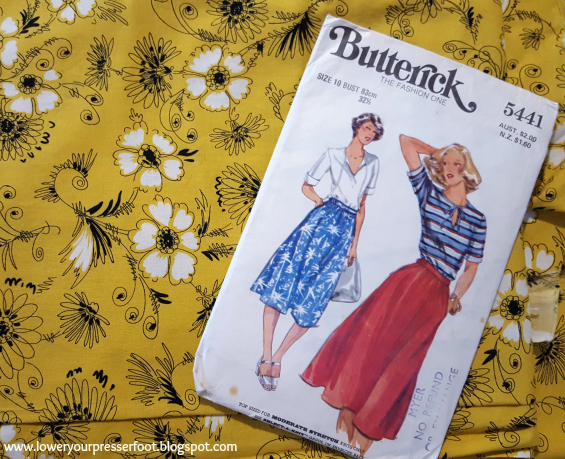 I used some yellow cotton from the stash for the contrasting colour to pick up on the yellow in the print as well as it being Anna's current favourite colour. I like those gathered cap sleeves even though they stick out a bit in this fabric, but I do think there could be more fabric at the centre front there to make those gathers look a bit more obvious.